Vankaya inguva karam / Egg plant curry,is one of the South Indian traditional recipe,which does not contain either garlic or onion and is a sathvik food item which goes well with south indian families..It can also be prepared as stuffed brinjal / egg plant curry,by stuffing the spicy curry paste in to the brinjals cut into 4 halves with the ends intact..You can make it when you get bored with onion or garlic..or on festive days. Egg Plant - Either made in to pieces or cut into 4 halves for stuffing with the end of the brinjal intact..
(or u can even dry roast them)then fry urad dal, methi seeds, red chilles, jeera. At last add hing before 1 minute you switch off the stove. Make paste of all the above ingredients by adding some water. Take a pan add the oil to it. Add egg plant pieces(or add stuffed brinjals), grinded paste, salt, half cup of water and close the lid. Adjust water to consistency. Keep stirring in the middle so that it will not be burnt. Switch off the stove when done. You can eat this curry with the rice and roti. This looks delicious even without garlic....I usually use garlic with eggplant...Nice recipe..
yummy and delicious eggplant curry. 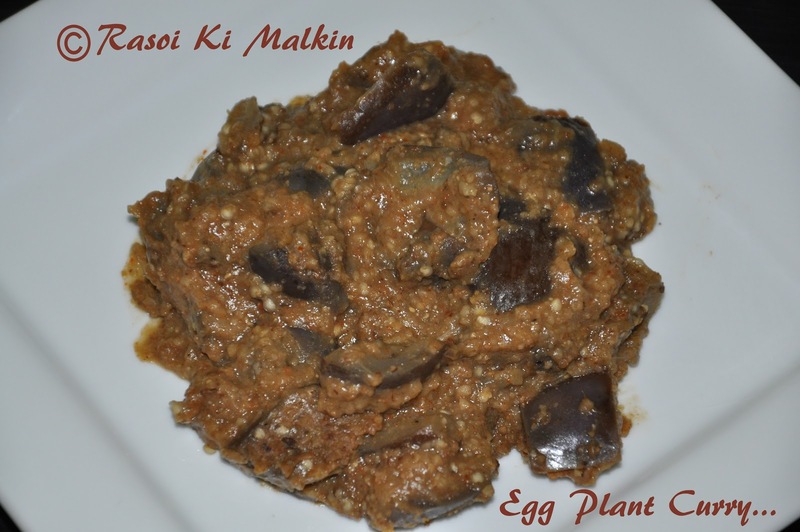 I love egg plant and this recipe sounds awesome. Using hing in cuurry i love it.Looks yummy and tasty. enjoyed reading "kitchen the beauty clinic " . I also add lots of garlic when i prepare eggplant . Adding hing sounds interesting. I love the flavour of hing in curry. Spicy & delish. Perfect for pulao / dosas / rotis.. This eggplant curry looks delicious. Amma used to make. This curry is very new to me..Sounds delicious.. Thank you all for your wonderful encouragement,coz these are the rechargers for me..